Make iPhone/iPhone 4 M4R Ringtone from your own video, audio and DVD sources. Innovative software tool gainings from the most asked for in download internets sites! Explore the featured computer tools classes, watch the newest releases of the perfect programs, and try at once! Do not lose opportunity to test the first class utilities: employ SoftEmpire to download software solutions for free of charge. See the library of shareware and software tool releases. Select among computer applications, test manipulators, games, and all other varieties of programms for your computer or digital phones! Aiseesoft iPhone Ringtone Maker is the best software for you to rip any DVD disc and convert popular video/audio files, including MPG, MPEG, MPEG-2, VOB, DAT, MP4, M4V, TS, RM, RMVB, WMV, ASF, MKV, AVI, 3GP, 3G2, FLV, SWF, MPV, MOD, TOD, QT, MOV, DV, DIF, MJPG, MJPEG HD video and MP3, MP2, AAC, AC3, WAV, WMA, M4A, RM, RAM, OGG, AIF, AIFF, APE, FLAC, AU, NUT audio, to iPhone M4R Ringtone, then transfer the ringtone to iPhone directly. What's more, it is highly compatible with the iPhone 5, iOS 6 now after upgraded. This iPhone Ringtone Maker can assist users to adjust the output ringtone volume and add the fade-in and fade-out effect for better enjoyment. Using iPhone Ringtone Maker, you are free to edit the existing iPhone ringtones. For instance, you can remove/rename it, and export iPhone ringtones to iTunes/computer/iPhone directly. This software enables users to connect more than one iPhone devices to computer at the same time. And users can easily choose the device you want to add the created ringtones. 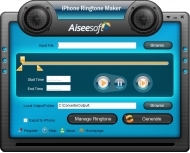 Aiseesoft iPhone Ringtone Maker also supports all iPhone versions (iPhone, iPhone 3G, iPhone 3GS, iPhone 4, iPhone 4S, iPhone 5).